My friend Lauren and I checked out the soft opening of Mac & Cheeza tonight. The shop, located on 8th Street downtown between Spring & Main, offers great customizable macaroni and cheese. When I walked up to the counter and asked about gluten free options the cashiers were very knowledgeable about what I could and could not eat. They told me that the rice noodles are gluten free and that the soy cheese is as well; however, the regular cheese is not gluten free because the sauce has wheat in it. I describe them as cashiers because this isn't your typical full service restaurant. Instead, it's more of a to go place. We were lucky enough to grab seats, but the restaurant has seating for less than 10 people. Make sure that when you order you tell the cashiers about your gluten sensitivity (and other sensitivity you may have). They were extremely helpful in picking out what I could and could not order. I wouldn't have guessed that the non-soy cheese had wheat in it! This is my second foray into gluten free mac & cheese after having visited S'Mac in New York City. S'Macs macaroni and cheese reminded me of the mac & cheese of my childhood -- it was a bit crunchier while Mac & Cheeza's was softer and certainly more pasta-like. My friend and I each ordered the "Baby Mac" size -- the total came out to $7 for each Baby Mac and it was the perfect amount of food. They currently do not accept credit card but once the store opens they will begin accepting them. It's great to have a gluten free mac and cheese option here in Los Angeles particularly one with such interesting toppings. My mac and cheese was made with tomatoes, bacon, soy cheese, and spicy toasted walnuts. My friend designed her mac and cheese to have peas, chorizo, and the crushed walnuts. She also added plentiful hot sauce to her dish -- turns out she is a hot sauce freak. Who knew? If you're feeling adventures you can also add ground beef, BBQ chicken, hot links, tuna, ham, or veggie sausage for some more meat. On the veggie side, the restaurant also offers collared greens, black olives, jalapeños, green onions, mushrooms, and spinach. I unfortunately did not have my camera on me -- for pictures, check out LAIst's writeup here. The restaurant will have its grand opening on March 11th which coincides with March's Downtown Art Walk. If you haven't done the Art Walk yet, what are you waiting for? My friend Allison and I went to February's event and loved it. It's really great to see downtown come alive and there are so many wonderful art galleries to visit! Having Babycakes close by is an added benefit of course. For my inaugural post about San Francisco I'm so excited to write about Mariposa. Before this weekend's trip I had only been to San Francisco once. That first trip was over Halloween '08 and it rained all weekend. It was truly an awful introduction to the city; luckily this weekend I was afforded beautiful weather and was able to experience the city as it is meant to be visited. On Saturday the weather was absolutely beautiful so my friends Danielle, Whitney, Sammy and I walked along The Embarcadero and enjoyed the beautiful views of the water and the Bay Bridge. I wasn't feeling that hungry as they picked up their lunches so I sat with them while they ate and we caught up. It had been way too long since I saw Danielle and Whit; Sammy is a new friend who I was introduced to while in SF. When we were exiting Ferry Building Marketplace, a large sign that read "Gluten Free" caught my eyes. 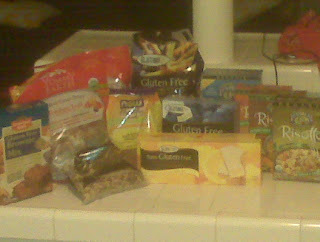 I walked over and was so happy to see an inordinate amount of gluten free treats in store. Mariposa's new kiosk was right there in the Ferry Building Marketplace! They had gluten free sandwiches, muffins, cookies, and brownies on hand. I indulged myself and picked up a sandwich because really, how often is it that we gluten free folk are able to so easily buy a sandwich? While the picture above makes the sandwich look small it was anything but; it was an enormously satisfying lunch filled with salami, arugula, and tomato-rubbed bread. The bread was just as I remembered gluten filled breads being; crunchy with great texture, it perfectly complemented the flavors of the meat and vegetables in the sandwich. The bakery's location in the Marketplace is a small kiosk; they run a larger shop in Oakland. I was talking to my college friend Kelley today online after I saw she linked to a blog advertising the 2-for-1 Pinkberry special that is continuing until Friday, February 19th. Obviously I made her change the link to my blog! Kelley works for a really cool company called TripFilms which commissions people to produce videos about their travels. When I told her I was looking into new options for the site, she pointed me towards a video on the TripFilms site about a restaurant in Madrid called El Vergel which offers gluten free options. After watching the video (below) I was definitely feeling hungry. I did a little Googling for the restaurant, found its location, and did a double take. The restaurant is located at Paseo de la Florida 53 -- and I lived at Paseo de la Florida 33 when I lived in Madrid! I spent 9 months in Madrid during college and absolutely loved the city, but it was difficult to find gluten free substitutes. This restaurant was so close, yet so far; I can't believe I never knew about this place! I guess I'll have to go back to Madrid and check out El Vergel's gluten free offerings. My roommate from last year Vanessa told me about SunPower Natural Cafe so long ago that I had nearly forgotten about it. While Studio City is pretty close to where Vanessa and I lived in Downtown L.A. (just a short drive up the 101), from West Hollywood it always seemed so... far. Today, President's Day, was the perfect day to correct that line of thinking since there would be no traffic because of the holiday. I met my friends Hilary, Anna, and Rochelle to catch up about our respective Valentine's Days and weekends. It also wasn't far at all; my West Hollywood locale makes everything relatively close. SunPower is entirely vegan and many of the options are also raw. I asked the waiter which options could be made gluten free and he said that almost everything was already gluten free. I ordered the "Raw Supreme Pizza," Hilary ordered the "Raw Pesto Pizza," and Anna and Rochell each ordered the "Kale Colossus" salad. When the Anna and Rochelle's salads came out my jaw practically hit the floor. The portions at SunPower are enormous; it's almost guaranteed that nobody will leave this place hungry! My pizza, along with Hilary's, were beautiful. Its appearance was only second to its taste. The crunch of the thick sunflower seed crust was terrifically bursting with flavor. I'm normally a fan of a softer, chewier crust, but in this case the crunch totally worked for me. 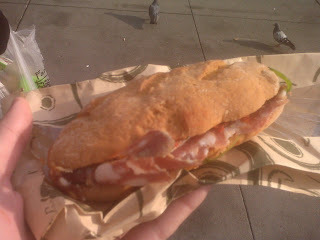 The drizzle of macadamia cheese and "sausage" (read: sausage replacement made of nuts) was wonderful. 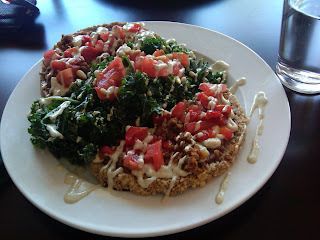 The kale salad in the middle created a healthy lunch that was bursting with incredible flavor. My lunchmates were kind enough to allow me samples of their dishes, all of which were spectacular. If you're gluten free, I would check out SunPower for the cafe's unique take on pizza. While I absolutely love Real Food Daily's take on gluten free vegan pizza, SunPower has got them beat. I'll definitely be visiting again soon. To celebrate Valentine's Day, Pinkberry is offering a buy one get one free deal. 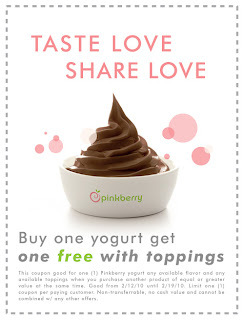 That makes Pinkberry a great option for a cheap Valentine's date! To get your coupon, click here. By the way, Pinkberry has unfortunately discontinued its Gluten Free Chocolate Cake Crumble topping. This is my first post about Philadelphia -- so welcome to any readers from Philly who stumble upon this post! My brother has lived on and off in Philadelphia for the past 9 years... whoa. Sorry to break that sentence off, but that sentence is crazy -- 9 years can really fly by! 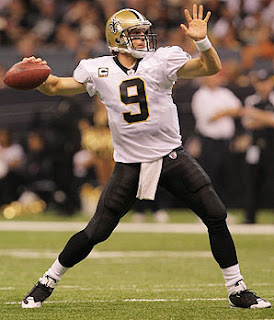 Anyways, Jeff has been living in Philadelphia for a long time and is currently in law school there. His girlfriend Morgan is potentially gluten intolerant so I did a little searching for some gluten free options in Philly. I stumbled upon Sweet Freedom Bakery and sent Jeff the link a few weeks back. This past weekend Jeff and Morgan were able to visit the bakery and give me their opinions. There were reactions were very positive. A direct quote: "Morgan tried the brownie which was awesome, and I had the chocolate cookie sandwich that is in the picture (below). That was incredible." I don't have much to add since I haven't visited the shop myself -- everything in the bakery is vegan and gluten free, for you vegans out there. I'm hoping to make it to Philadelphia for Jeff's graduation in May, so look for a longer post then. In the meantime, I'll have to satiate myself with Babycakes! Today I visited my Aunt and Uncle and my brand new cousin, Eliana, who all live here in Los Angeles. I know that when I head over there I'm bound to be fed great gluten free food and today was no exception. 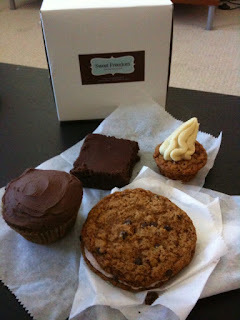 They even surprised me with some delicious gluten free chocolate muffins from Schwartz Bakery here in Los Angeles. It never would have crossed my mind to check Schwartz for gluten free products, but my uncle said that he was recently in the store and saw the chocolate muffins prominently labeled "gluten free" so he picked some up for me. The store also offers gluten free brownies, bagels, and vanilla cupcakes. The treats were good but not great -- the bakery isn't dedicated to gluten free baking so it can't rival the expertise of The Sensitive Baker or Babycakes. However, it's great for gluten free people who keep Kosher to have a viable option. I know that Babycakes and Sensitive Baker are both Kosher as well, but with the varying degrees of Kosher food Schwartz's may be some people's best option. I normally avoid the bakery section of grocery stores. Why go if I'm only going to be tempted by the best gluten filled baked goods the market has to offer? Fortunately my friend Lulu keeps her eyes out for gluten free treats around L.A. for me. 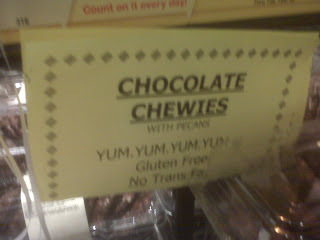 While shopping in the West Hollywood Pavilions, she found Chocolate Chewies in the bakery section that she thought would especially appeal to me since they were marked with a gluten free sign! I know the photo quality isn't great, but it was really nice to see freshly baked gluten free products in a market like Pavilions. It was even better that they were marked as such! 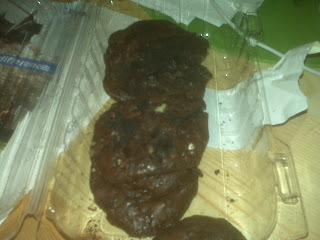 The cookies are great; very chewy, as their name implies, and very flavorful. They're made from sugar, pecans, water, cocoa, egg whites, vegetable oil, salt, and modified food starch. They are not marked gluten free on the packaging itself. Another great part is the price -- they cost about $3.50 for an entire package! 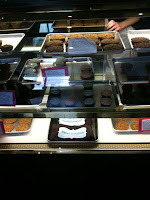 Where else can you find freshly baked, delicious gluten free cookies for that cheap? Unfortunately I stopped in the store pretty late at night and wasn't able to locate a manager to see if these would be in stock permanently or are just a temporary item. So run... er, since we live in Los Angeles, drive, don't walk, to Pavilions' West Hollywood location to pick yourself up some of these delicious cookies! 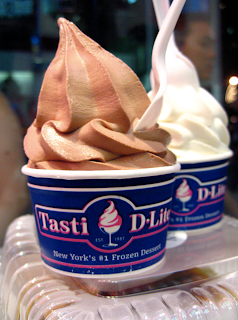 Tasti D-Lite has just released a full list of gluten free flavors available at the frozen yogurt chain. You can check it out here. Unfortunately there are no locations in CA yet.